The Samsung Galaxy A80 will hit the markets on May 29 and come in Gold, White and Black. There’s no official word on official pricing yet, but we’ve heard rumors that it’ll cost about $650, or roughly the same cost as the Samsung Galaxy S10e. That begs the question, which would you rather have? 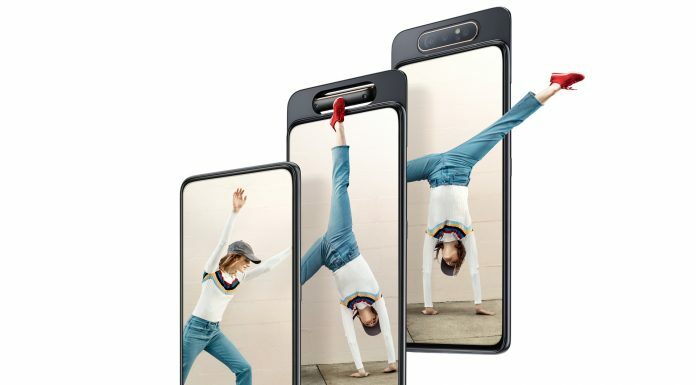 The Galaxy 10e with the flagship processor and smaller, but flat and higher resolution display, or the Galaxy A80 with the larger display and new camera module with higher resolution lenses? Hit us up on Twitter and let us know what you think.